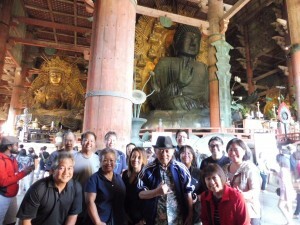 Day 1-2: A total of 15 of us left Honolulu for Tokyo, a cosmopolitan city of about 13.6 million people in Japan. 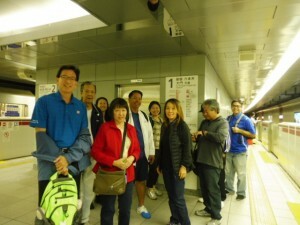 Although we arrived late at night, some people still had energy to explore the area closed to the hotel in Shinjuku. 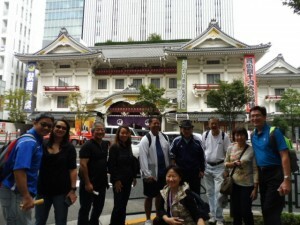 Day 3: After a sumptuous breakfast, we were all ready to explore the city. 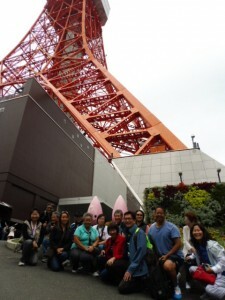 We first headed for Tokyo Tower, lead by our bilingual guide, Kimiko. The weather was cloudy but we could see the massive expansion of the crowded city of Tokyo from above. 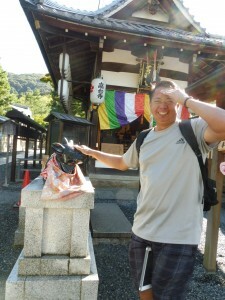 Today was the Japanese national holiday, called Sports Day. 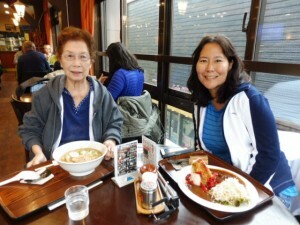 The traffic was very smooth so we could include more places to visit. 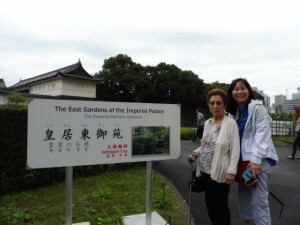 We visited the East Garden of the Imperial palace to see the beautiful Japanese garden. 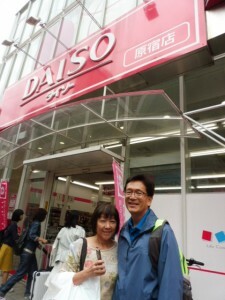 Then, we visited Sensoji (temple) in Asakusa instead of Hanayashiki Amusement Park since we didn’t have any kids and the group was not interested to go there. 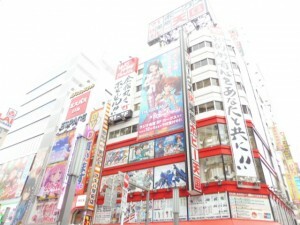 On the way back to our hotel, we stopped at Akihabara, a well known electric town in Tokyo. 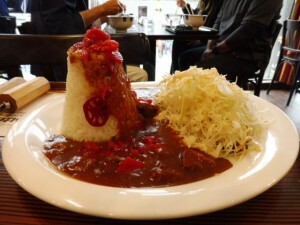 We had a unique lunch called Monjya Yaki. 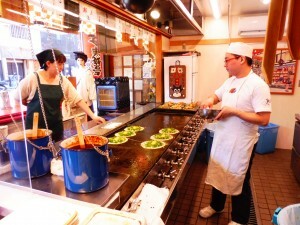 It is similar to Okonomiyaki (pan-fried batter) but it has a more oatmeal like consistency. It wasn’t aesthetically appealing but the taste was good. 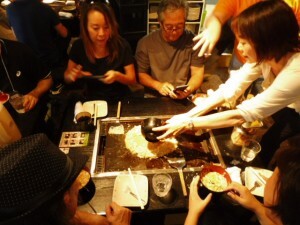 It was the first experience for all of us to try Monjya Yaki including myself. 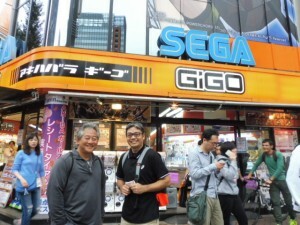 Day 4: Free day in Tokyo. 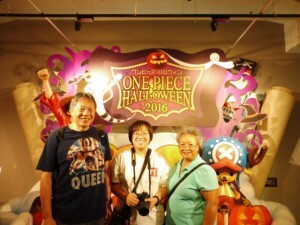 A family of 3 went to the Tokyo Disneyland, a couple went to visit Naritasun in Chiba, and the rest of us visited Tsukiji Fish Market, Ginza, Harajuku (where one of the biggest 100 yen stores in Tokyo was located). 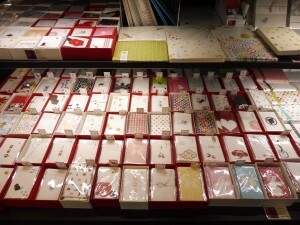 The last stop was Tokyu Hands in Shinjuku. 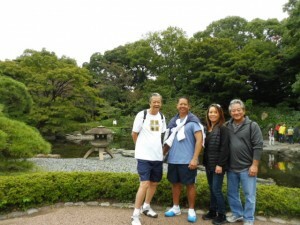 A lot of walking from the morning until late afternoon…. 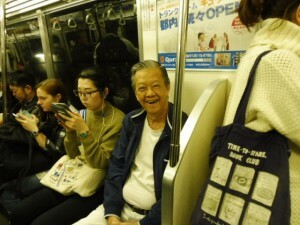 For many, riding the public transportation such as subways and trains in Tokyo seemed exciting. 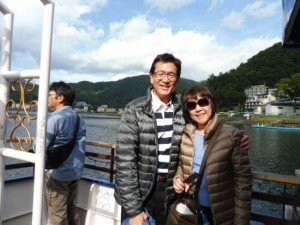 Day 5: The Lake Kawaguchi near Mt. 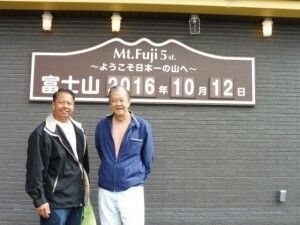 Fuji was our destination today. 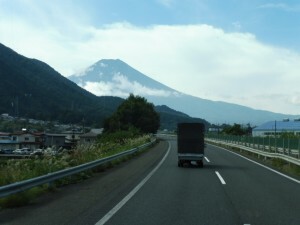 We were very lucky to see Mt. 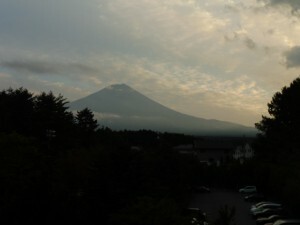 Fuji from Tokyo. Mt. 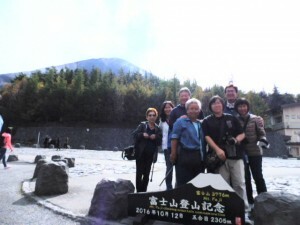 Fuji, the tallest mountain in Japan, was designated as the UNESCO heritage site in 2013. 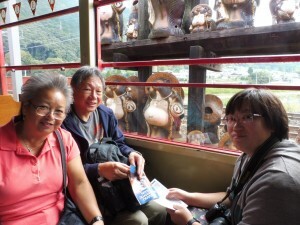 We went up to the Subaru Line 5th station (at 7000 feet above sea level) by bus. 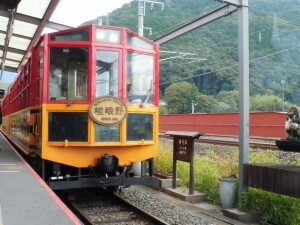 Although mid October is still too early for autumn color in Tokyo and its surrounding areas, and the southern part of Japan, we could see some colors at the 5th station. 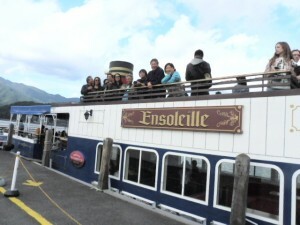 Afterwards, we enjoyed 20minutes boat ride at the Lake Kawaguchi. 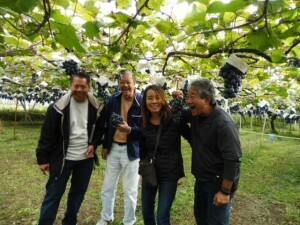 We also enjoyed grape picking at Misaka Farm in Yamanashi Prefecture. It was so juicy and delicious! Unlike Japan, it is very difficult to find quality grapes in the US. 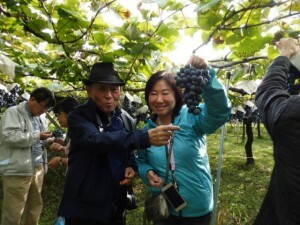 Yamanashi is very famous for grape picking in the autumn and peach picking during summer. 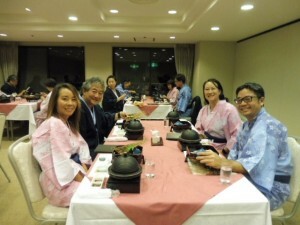 At the hotel near Lake Kawaguchi, the Japanese set dinner was provided so all of us wore yukata provided by the hotel and immersed ourselves in Japanese cultural experiences. 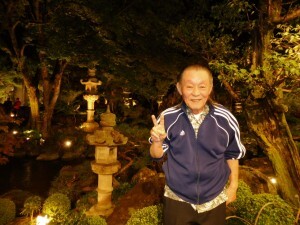 Ah, how wonderful and relaxing the Onsen (hot springs bath) was!! 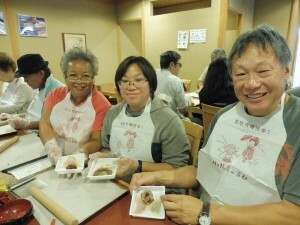 The best therapy for stressful life and the most popular activities of Japanese nationals! According to the weather forecast, today was the coldest day (about 45 degrees) in this season. 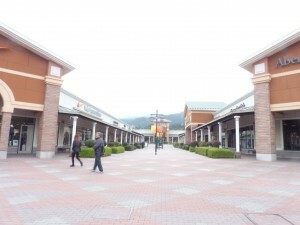 We visited the Odawara Outlet Shopping Mall, Owakudani Valley and Sekisho in Hakone. 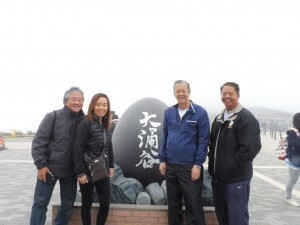 Unfortunately, we hardly could see the view at Owakudani. We caught a JR bullet train to Kyoto from Odawara. 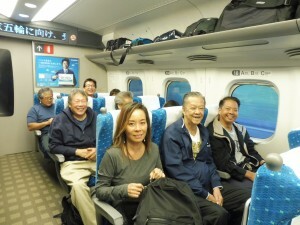 The first time visitors seemed to enjoy the experience of riding the super express train. 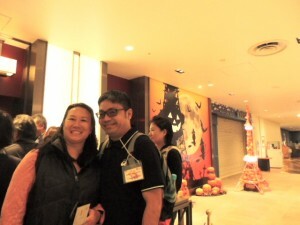 The hotel was within walking distance from the Kyoto Station so it was very convenient. 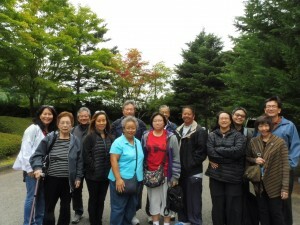 After checking in, everyone explored the nearby area from the hotel. 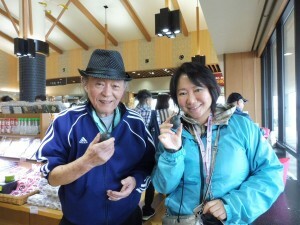 Day 7: We were met by our new guide, Mineko, and headed for Arashiyama by using the Sagano Arashiyama Sightseeing Tram. 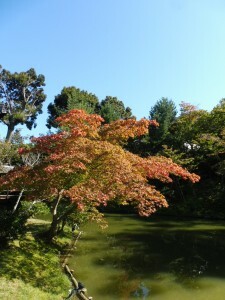 The tram ride was fun but it was still too early to see a beautiful autumn colors. 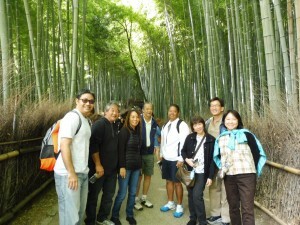 We also walked through the popular bamboo trails. 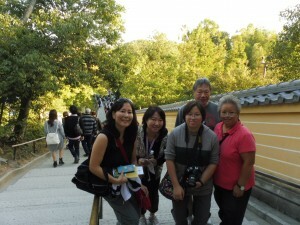 Afterwards, we visited the famous Kinkakuji (Golden Pavilion), another UNESCO Heritage Site. 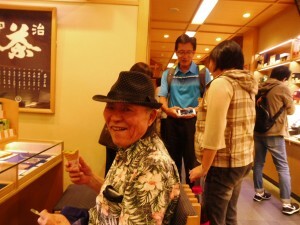 Some enjoyed eating tea ice cream at the Golden Pavilion and they said it was really delicious. 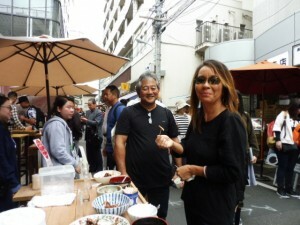 The hands on experience of making famous sweets called Yatsuhashi was exciting for us. We thoroughly enjoyed not only making them but eating them, too! 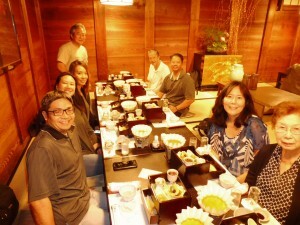 For dinner, we went to Ganko Nijyoen, which used to be an ex-prime minister’s house turned into a Japanese Kaiseki restaurant. 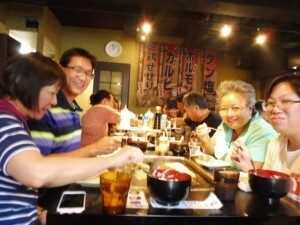 The ambiance of the restaurant was wonderful and we felt like we were indeed in Kyoto. 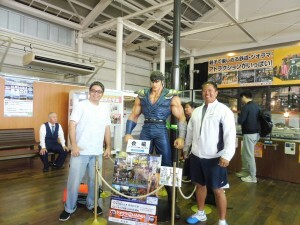 Day 8: The last day of our trip. The weather was beautiful, blue sky and crisp air. 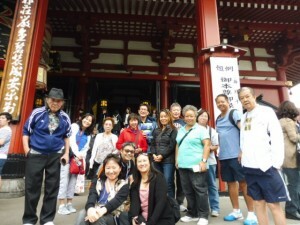 We visited Kodaiji Temple in Kyoto and walked around Gion district. 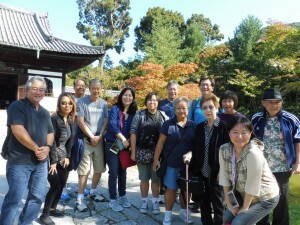 Some of us were very lucky to see Maiko, though they were not fully dressed as Maiko. 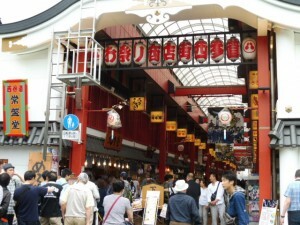 It was a very nice walk with lots of stores and eating places. 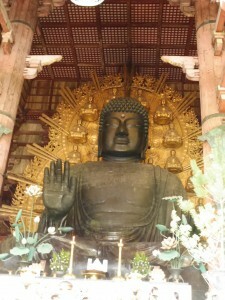 We stopped at Todaiji Temple in Nara before heading to the Kansai International Airport. 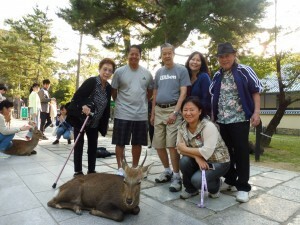 There were many deer waiting for their food at the entrance of the Todaiji Temple. 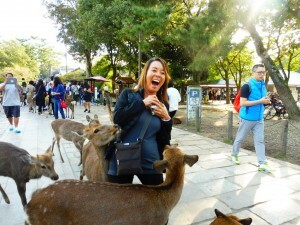 For a while, it was fun to feed them but they became aggressive to get more food so some people got a bit scared. It was an action packed day again. Too bad we couldn’t stay longer. 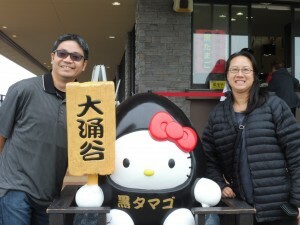 We only touched a very few highlights of Japan but hope that this trip gave some people an introduction and the exposure to Japan and its culture. Wishing for them to come back to experience Japan more fully in the future! 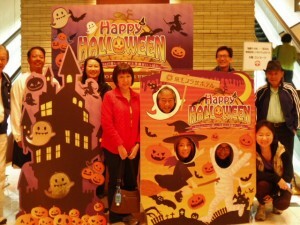 It was a very fun group of people. Hope to see you someday! 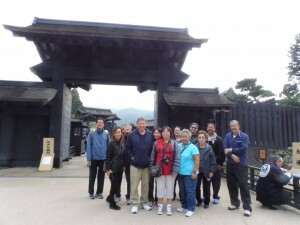 Explore Japan’s top destinations with the help of JTB Sunrise Tours. Now 2017 schedule is available. 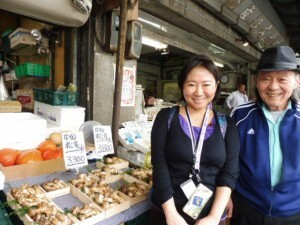 Search JTB’s Special discounted Airfare to Japan and Asia min min.